This figure comes from a painting showing people under attack in Paris in 1572. It offers a rare glimpse of a citizen in incomplete dress. (A citizen is one of the four “sorts” in Tudor society according to Sir Thomas Smith, a contemporary commentator in 1583). It’s a felted sweater that I had lying around, cut to the style of Tudor square necks (the straps kept crawling down my shoulders though- argh). It was period-specific in the use of hooks & eyes. The smock is the white, and that is from the book too. The skirt is sadly polyester because I’m so bad at determining fabric from feel! It’s sewed according to Tudor style, with a few pleats in front, as haped skirt, and about 20 pleats in back, 4 yd/12 ft diameter. It doesn’t have a zipper and I kept little purses tied to the waistband. Waistband, sadly, I had to do myself as originally this would be sewn to the bodice but I didn’t think the felt could handle the weight. Sleeves are “pinked”- cut- with the lining, satin, underneath. The Tudor Tailors pinked leather, but I went the cheap route with red denim and fake satin. The sleeves were the hardest, as I had to introduce a satin band to anchor the gathers underneath and hide/serge the satin seams. French seams on sleeves, and skirt. I didn’t scale the armholes properly so they are too tight- need to expand with a gusset, otherwise this is a very durable costume. 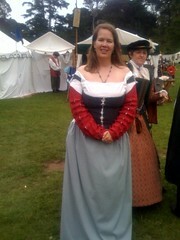 Next up: a Tudor-style short & flared waistcoat that I can wear all the time, made of high quality wool. And a rose-patterned jacket and pants Funk suit that I’ve wanted *forever*, as well as some more lined skirts. The big lesson in making this costume is that I can sew from photos- I used the cutting patterns somewhat but mainly worked it all based on that photo above (there is another in the book without her great coat). Written Sunday, August 17th, 2008 in crafts. You can leave a response, or trackback from your own site.